U.S. Citizenship and Immigration Services announced they are recalling approximately 8,543 Permanent Resident Cards (also known as Green Cards) due to a production error. SAN DIEGO (NEWS 8) - U.S. Citizenship and Immigration Services announced they are recalling approximately 8,543 Permanent Resident Cards (also known as Green Cards) due to a production error. The Green Cards were for approved Form I-751, Petition to Remove Conditions of Residence for spouses of U.S. citizens. The cards were printed with an incorrect "Resident Since" date and mailed between February and April 2018. USCIS will send notices to individuals who received the incorrect Green Cards and to their attorneys of record, if they have one. The affected individuals should return their incorrect Green Card to USCIS in the provided pre-paid envelope within 20 days of receiving the notice. They may also return their cards to USCIS field offices. 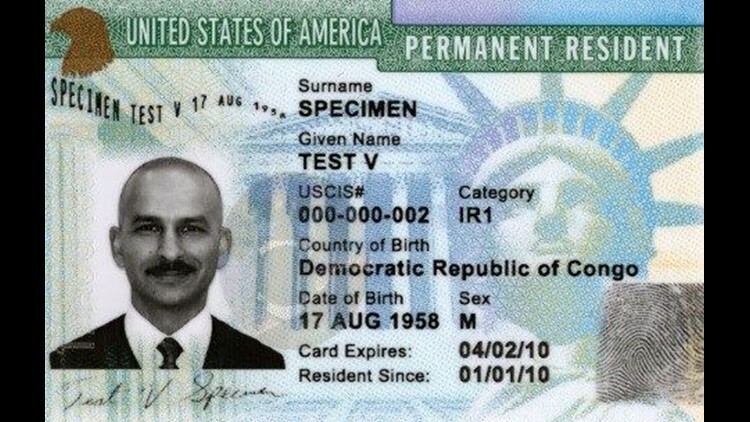 USCIS will send replacement Green Cards within 15 days of receiving the incorrect card. The recall does not affect the Green Card holder's status as lawful permanent residents. If affected individuals need to travel internationally or prove their lawful permanent residence while they wait for a replacement card, they may contact the USCIS Contact Center at 800-375-5283 to determine if they need additional proof.